Tags: 2020VQ, Food, Inspiration, success, Team 2020. Here at 2020 Vision Quest, it seems we’ve have had one non-stop exciting adventure after another and we’re barely done with our inaugural month, much less our first year’s hiking season! And right now, we’re all about celebrating our successes and sharing our hopes and ideas for the upcoming year with everyone who’s been so supportive of the project. 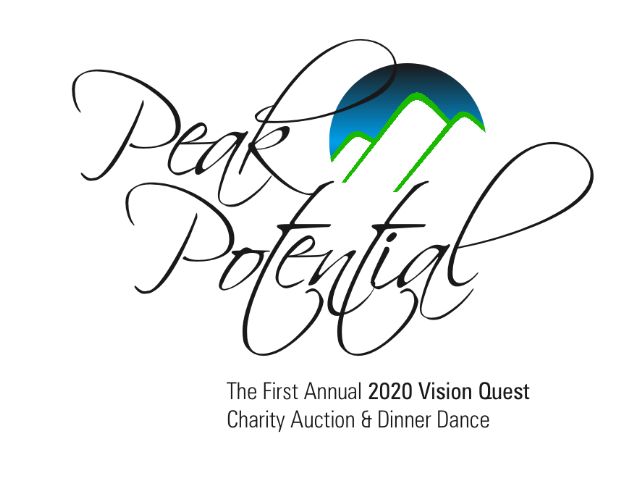 To do this, we’re holding Peak Potential, our first annual Celebration Dinner & Charity Auction, on October 23rd. We’d love to have you join us at The Derryfield in Manchester, NH. Randy (with the help of the Mighty Quinn) will give a special presentation about where we’ve been and where we’re going, along with some never before seen video from the climbs. Enjoy hors d’oeuvres, a sit-down dinner (your choice of Pan Roasted Salmon, Cranberry Walnut Chicken, Prime Rib or Spinach Stuffed Tomato), and dancing galore, along with a cash bar. In between courses, there will be both silent auction bidding and the opportunity to win several very special live auction packages intended to inspire, educate, and help challenge the winning bidders to achieve their own visions! Tickets are available for pre-order online, by emailing Donate@2020VisionQuest.org , or by calling 1-888-54-2020-1 x10. No at-the-door tickets will be sold. If you’ve got something you’d like to donate for sale at the auction, please let us know (most goods and professional services are considered tax deductible contributions). * A portion of your ticket price is a tax-deductible donation to 2020 Vision Quest, a 501(c)(3) charity. Tags: 2020VQ, Food, Hiking, safety, Support, Team 2020. I never knew beef could be such an important part of a trip. I don’t eat a lot of red meat, but I’ll eat pretty much anything on the trail. 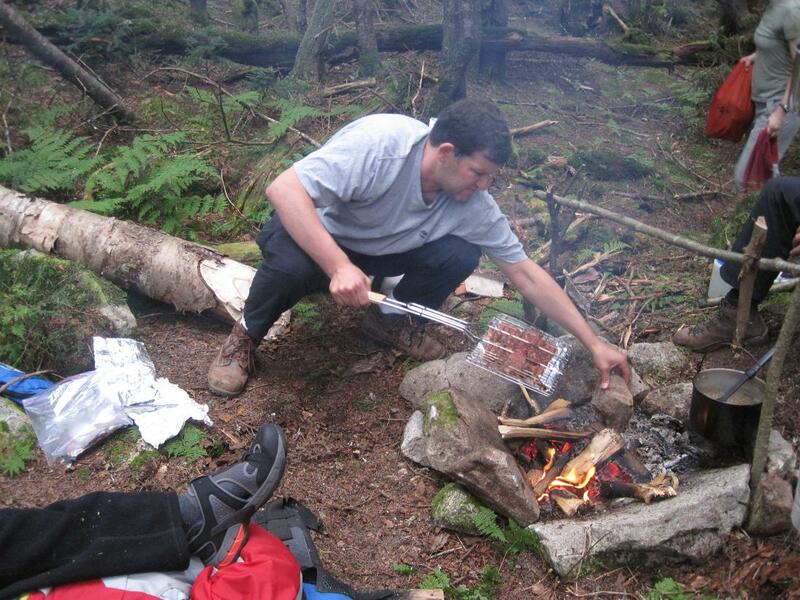 So, when I heard about how a few of the hike participants had eaten steak tips once on a previous backpacking trip, I was pretty excited. The steak tips ended up being a really important part of the trip – they became both the high and low points of the weekend. 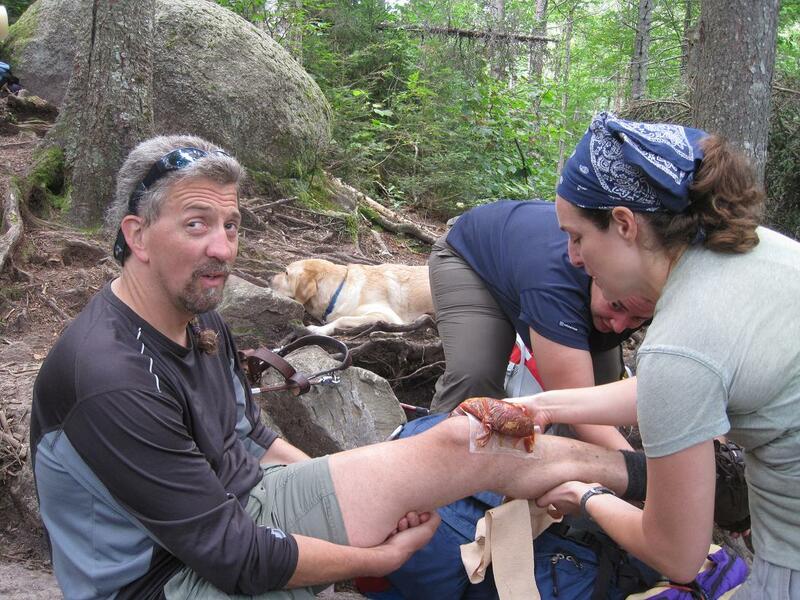 Kara applies frozen steak tips to Randy's injured knee. About an hour into the hike, as you may have read about by now, Randy’s knee swelled up like a ping-pong ball within seconds after his fall. I knew having something cold on the injury would help, and Kara had to remind me that in the depths of someone’s pack were some tasty and frozen steak tips. After 20 minutes of freezing Randy’s knee, the swelling went way down and we were ready to move on. I really think that the icing minimized the extent of his injury dramatically. Rob cooking up the steak tips. Mmmm! Once we were done freezing Randy’s knee with steak tips for a second time before dinner, we had the pleasure of eating them. 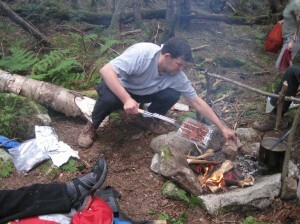 I was gone for about 45 minutes getting water and by the time I got back, the boys had rigged up a fancy campfire – and those steak tips melted in my mouth as I finally relaxed from the day. Add to that a delicious lentil stew with fresh rosemary and we had ourselves a recipe for a great evening. We spent several hours reminiscing about past hiking experiences and got to know each other better through interesting and challenging questions. As the evening got later and darker, I’m sure we were smiling big with full bellies and great company. 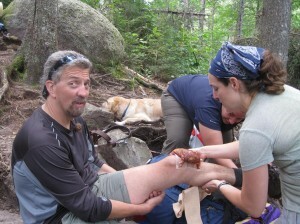 Every hiking trip is different – some go smoothly, some don’t. The bumps of this trip were…literally, bumps. There were many things to think about as Randy hit his knee twice and sliced his hand, and trust me – my mind was going a mile a minute as I considered the ramifications of his injuries to himself and the group, while simultaneously thinking about how to treat the situation. I’ll be honest – it’s mentally tiring to balance all of those things as a leader.